The 18 metre tall observation tower offers its visitors a panoramic prospect of Fochteloërveen, an area owned by the Dutch National Trust (Vereniging Natuurmonumenten). The basic shape is derived from that of a periscope. Part of the strip of viewing glass on the observation platform has been left out to retain some contact with the open air. To accommodate visitors with a fear of heights, the steep stair has been bent in such a way as to rule out any direct views en route. 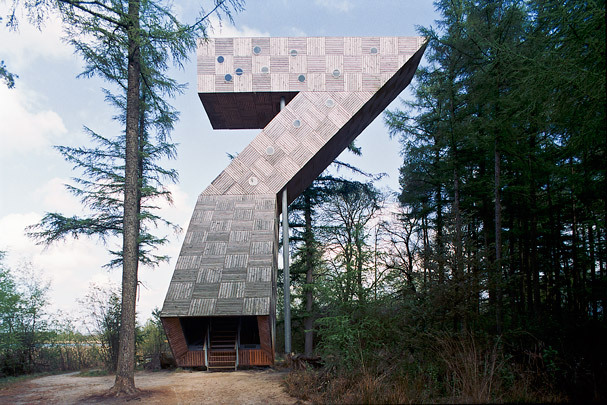 The steel structure has a cladding of larch panels, some of which are rotated 180 degrees to vary the pattern. The more the wood weathers, the more the tower blends among the trees.